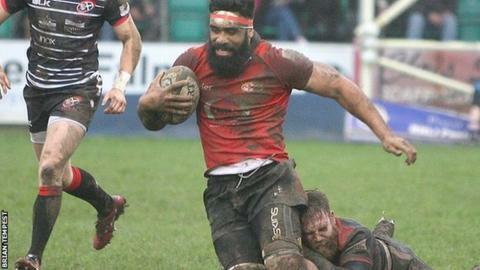 Jersey Rugby Club want to remain a "viable" second-tier side and are targeting the Championship play-offs in a new five-year Strategic Plan. The 16-page document also suggests at least two locally-produced players should be appearing regularly in the team by 2020. Once full of Jersey-born players, there are now few in Harvey Biljon's squad. The islanders are currently enjoying their best-ever season, lying fifth in the Championship table. "We're playing good rugby and we want to develop," chairman Bill Dempsey told BBC Radio Jersey. "It would be fantastic to have a semi-final of any type in Jersey, so that would be the aim and supporters come to watch winning teams. "We've been fire-fighting a bit off the pitch and this gives us an opportunity to put something together for the future." Jersey's rise up through the English rugby pyramid in the last decade has been remarkable to watch, with a spell of four promotions in five seasons between 2007-08 and 2011-12. While some may question the lack of ambition in targeting a spot just one place higher than they currently sit, Dempsey thinks a further promotion to the Premiership would be an unrealistic aim for the next five years. "If you look at Bristol, they've spent possibly £30m-40m and are still not in the Premiership, it gives you an idea of the requirement," he said. "Along with a 12,000-seater stadium, you'd possibly need to spend another £35m to get there, you've got to have around 50 players and be sustainable once you get there. "I think it's unrealistic [for the five-year plan] but rugby will change." Off the pitch, a new seated area, a covered-terrace and floodlights are among the recent developments at St Peter, but the Strategic Plan suggests further improvements. The club wants to "develop and increase the overall spectator capacity with particular emphasis on seated, covered areas, to match demand". Jersey vice-chairman Mark Morgan spoke to members at the launch of the plan on Thursday night. He said: "The strategy is encapsulated in the ambition of our mission statement, which is to enrich Island life by achieving consistent success on the rugby pitch, underwritten by a viable business model."